Nicholas Hytner’s production of Hamlet at the National Theatre, which was transmitted in HD in 2010 and recently had an encore screening, is set in a distinctly modern police state where the omnipresence of security is such a familiar sight in the court of Denmark that the characters have stopped noticing them. 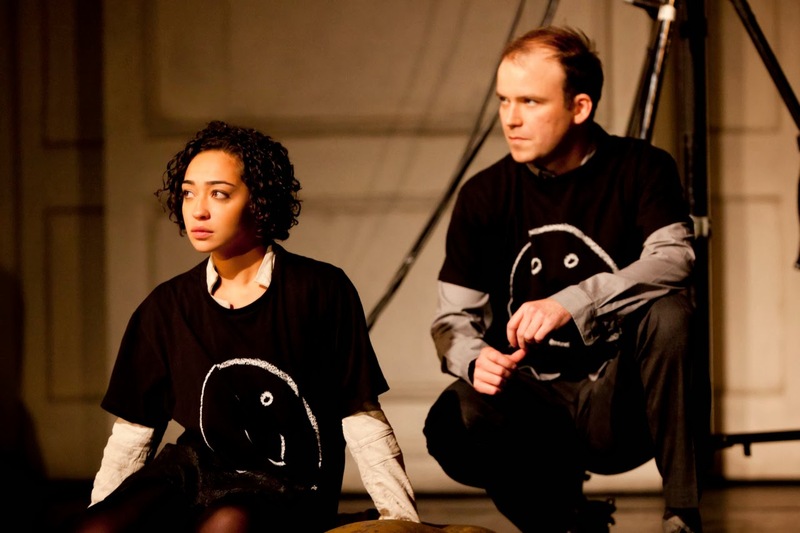 Polonius (David Calder) and Ophelia (Ruth Negga) talk freely in front of one guard, though the topic of their conversation is her romantic relationship with Hamlet (Rory Kinnear), and when Polonius confronts her about it, he produces a file containing photos of them together. Spying is a natural impulse to Polonius, who sends Reynaldo (Victor Power) off to France to check on his son Laertes (Alex Lanipekun) and later gives his daughter a walkie-talkie concealed in a Bible so that he and King Claudius (Patrick Malahide) can hear how Hamlet reacts when she returns his love gifts. The way Calder plays the old counselor, he has a passion for spying. He’s proud of himself for his ability to tender this service to his king – though when he tells his son, “This above all: to thine own self be true,” he pauses, unsettled, and you wonder if, just for a moment, he contemplates the possibility that he’s violated his own principles (at least since Claudius took over the throne). After Hamlet kills him by accident in his mother’s bedroom and Claudius can’t get him to stop clowning long enough to tell him where he stowed the body, one of the king’s men opens an attaché case full of torture instruments, and Hamlet, who has been handcuffed, acquiesces. Instead of being a fop (as he’s usually played), Osric (Nick Sampson) is the same military man who had a hand in Hamlet’s deportation to England – where he was supposed to be executed on the English king’s orders – and when he invites Hamlet to take part in the duel with Laertes, it’s obvious to us that he’s in on the conspiracy. These scenes are all of a piece; Hytner has worked through this concept with the same intelligence he applied to the twenty-first-century military setting of his Othello. But other Hamlets have done something like it – Michael Almereyda’s corporate 2000 cinematic adaptation with Ethan Hawke, for one – and though it certainly works, it’s not what drives the production. 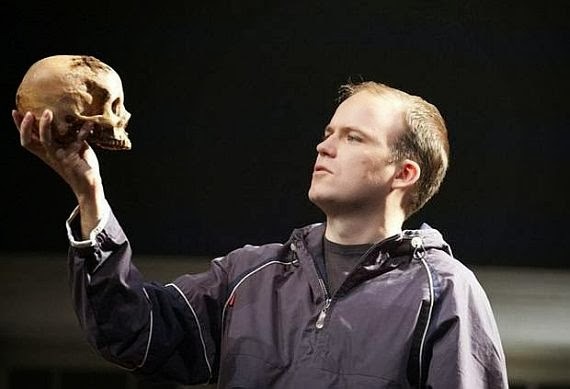 Rory Kinnear does, and that’s as it should be – a Hamlet where the star performance is second to the concept would be a mistake. Kinnear – a staggering Iago, a potent Bolingbroke, extraordinary in the National’s The Last of the Haussmans – may be, along with Ben Whishaw, the greatest young actor on the English stage right now, and he’s the finest Hamlet I’ve ever seen, including Laurence Olivier and Kenneth Branagh in their respective movie versions. Olivier chose to focus on Hamlet’s perilous emotional state, Branagh to underscore the character’s intellectual prestidigitation – the fact that he can both think and talk circles around everyone around him, and whereas Olivier’s Hamlet (for all its Ernest Jones-inspired Freudianism) was moving, Branagh’s was thrilling. Kinnear dips into both wells: he’s both intellectual and emotional. And he emphasizes the character’s youthfulness: his prince is still fresh in experience, free of cynicism (as opposed to his uncle, the monarch as CEO), trying like hell to negotiate his way through a nightmare that would lay low any young man of feeling. He’s raw, emotionally naked; all his punkish rebelliousness – his ironic attitude toward his uncle and Gertrude (Clare Higgins)in the first court scene, his scribbling “villain” under a smiley face on the castle walls after visiting with the Ghost (for “one may smile and smile and be a villain”), the way he lends his “antic disposition” a kind of guerilla-theatre vibe and drops his pants before the Mousetrap scene to scandalize the court, his reappearance in the fifth act in a hoodie and shades – keeps reminding us that this is an undergraduate. The power of the performance is that it makes us anxious not just for him, but for all young men. Kinnear, like Whishaw, is a contemporary British actor: his classical training has been flavored with Stanislavski. So his readings of the four soliloquies, as well as “What a piece of work is man” and the apostrophe to Yorick’s skull, are not just technically brilliant; the heat of discovery steams up around them, as if he had no idea what he was going to say until a moment before saying it. My favorite is “What a rogue and peasant slave am I,” which spins off the Player’s reading of the Hecuba speech at Hamlet’s request dramatically as well as narratively. This first scene with the players is staged with the combination of logic, clarity and inventiveness we’ve come to associate with Nicholas Hytner. Hamlet attempts to produce what he recalls of the speech, while the Player (the superb James Laurenson, who doubles as a pitiable, all-too-human Ghost) listens politely, like a professional jazz musician who’s allowed an amateur to perform a solo in a jam session. Then he takes over handily and shows the prince how it’s done. His rendering of the speech is relaxed, precise, building to an impressive emotional peak without apparent effort. He doesn’t push or rush; it really is a master class in acting. Left alone, Hamlet is deeply upset by the contrast between this show of authentic feeling and what he thinks is his inadequate expression of his own grief, and as he spirals toward the core of that grief he winds up paralleling what the Player did with Hecuba. One of the keynotes of this production is the youthfulness of so many of the characters – not just Hamlet and Horatio (Giles Terera), Rosencrantz (Ferdinand Kingsley) and Guildenstern (Prasanna Puwanarajah) but also fragile Ophelia, who is listening to rock ‘n’ roll as she reads when we first meet her, and Laertes. This Laertes is a macho skinhead who’s rather blunt and unimaginative and whose reappearance in Denmark after his father’s murder, in torn-kneed jeans, waving around a rifle, is the kind of thuggishness a twenty-something who doesn’t know how to handle his anguish might affect. (He’s so naïve and unsure of who he is that he’s the ideal pawn for Claudius’s plot against his nephew.) When he and Hamlet brawl at Ophelia’s grave, it’s a macho competition to see who can make the most flamboyant show of mourning. Lanipekun does a beautiful job with Laertes’s confusion over Hamlet’s apology before the duel, which makes him question for the first time the justice of the murder he’s signed up to carry out. The age of these characters also explains why Hamlet is so furious at Ophelia for allowing her father and the king to spy on their conversation – which, untutored as she is in the corrupt ways of the court, she’s inept at disguising – that he explodes at her (“Get thee to a nunnery”) and continues to upset her the next time they meet, before the play within the play. Hytner is practically a genius at not just finding ways to contextualize Shakespeare’s tragedies for modern audiences but at making those concepts concrete. As in Othello, he works with designer Vicki Mortimer to create spaces within the palace setting that house the characters convincingly and provide a sense of how they’re connected to each other. (I’d also commend Jon Clark for his German Expressionist-style lighting.) When Rosencrantz and Guildenstern approach Hamlet for the first time, he’s in his bedroom, and we see both the interior and exterior. It’s such an undergraduate environment: books spill off the shelves, and when they enter he’s sitting cross-legged on a futon – the only bed in sight – smoking. The production is full of witty touches, like the silent-movie dumbshow that begins the Mousetrap, and the startled look on the face of Marcellus (Marcus Cunningham) when he sees the late King Hamlet’s photograph in the court, as if the Ghost he’d seen the night before on the battlements had come back in daylight. When Hamlet requests The Murder of Gonzago the Player looks worried; he knows the text and he knows Denmark is effectively a police state. When, following Shakespeare’s specific directions, the king rises during the Mousetrap scene, Claudius moves toward the dead Player King as if he were sleepwalking, drawn as if by a magnet to a replica of the scene of his own crime. In this Hamlet, Gertrude actually sees the Ghost when he appears in her bedroom, though she tells Hamlet she doesn’t; that’s a radical choice but it works. On the other hand, it doesn’t make sense to imply that Ophelia is killed by Claudius’s security guards; it makes nonsense out of Gertrude’s speech about her drowning and out of the king’s worry that the death of his sister will make Laertes, whose fury he has just calmed, volatile all over again. I liked Ophelia’s entrance for her mad scene with a supermarket cart full of bags and blankets, with a front-page photo of her father taped to the front, but though Negga goes for broke in this section, her ranting grows a tad tiresome. It’s the structural problem in Hamlet: in the fourth act, when Hamlet is off stage double-crossing Rosencrantz and Guildenstern and being kidnaped by pirates, the play seems to dawdle – especially when the Hamlet is as mesmerizing as he is here. When Kinnear’s Hamlet returns in act five, he’s the same angry, impetuous young man who boarded the ship for England, except now he’s truly armed for action. I don’t think that’s the way Shakespeare wrote the character, who has always seemed to me to have attained a modicum of acceptance, if not precisely serenity, that expresses itself in “There is a special providence in the fall of a sparrow.” But Kinnear is persuasive enough to make you go with this interpretation even if you don’t buy it. This thirty-five-year-old actor is astonishingly accomplished. You can hardly wait to see what he else he can do.